It’s only a rock ‘n’ roll poster. I’ve got a collection of flyers — you start to feel silly about it after a while, or at least you start to feel like you’re supposed to start feeling silly about it — for shows from my first couple of years at Auburn, and even some from before I was here. I don’t have the Rolling Stones flyer. 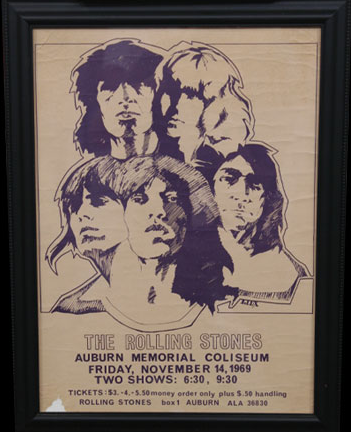 The Stones show is legendary among Auburn’s late boomers — hippie, straight, it don’t matter. Or I guess I should say shows, cause they played twice (the opener? Chuck Berry). They were stoned or drunk. Or lost in Loachapoka. Or something… and they didn’t get there till forever and didn’t play till even later. The story goes that the applause after the first show announcement that Dean Cater had for that reason extended the coeds’ curfew was the loudest of their entire tour (and immediately followed by Jagger cowbell’ing into “Honky Tonk Woman”). I’m still counting on the flyer for that first Pine Hill Haints show to pay off one day. you have a flyer for the first haints show? Even back then they had handling fees. I take back everything, Ticketmaster.